Kyle Palmieri scored the lone goal in a shootout, lifting the New Jersey Devils to a 5-4 win over the Tampa Bay Lightning on Tuesday night. Kucherov's goal was his eighth in seven games. He has scored at least once in every game this season, and the 24-year-old right wing became the sixth player in modern NHL history to score at least one goal in the first seven games of a season. Entering the nationally televised game, New Jersey's 4.20 goals per game were tied for second-best in the NHL, and Tampa Bay's mark of 3.83 ranked fifth. So befitting two of the league's highest-scoring teams, it didn't take long for the Lightning and the Devils to trade goals. Tampa Bay drew even when Namestnikov flipped an in-tight forehand over Schneider's stick at 7:33, and took the lead on Palat's power-play goal at 12:21. New Jersey equalized on Palmieri's rocket from the right side at 16:19, and Gibbons' goalmouth tap-in sent the Devils into the first intermission with a 3-2 lead. 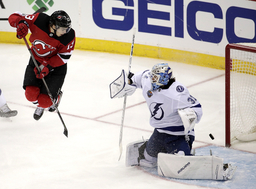 The Devils scored all three of their first-period goals on 15 shots, while allowing Tampa Bay to fire 11. For the game, the Lightning finished with a 37-34 advantage in shots. If the first period resembled a 100-meter dash, the second period was akin to a marathon. Both teams had scoring chances, but the defenses tightened up as Tampa Bay held an 11-9 advantage in shots. Still, it took just two to send the Lightning into the second intermission with a lead. Kucherov tied the game 3-all by ripping a slap shot under Schneider's glove at 14:02. Stafford's power-play goal with 4:06 left in regulation tied it at 4. NOTES: During his pregame media availability, Tampa Bay coach Jon Cooper was effusive in his praise of defenseman Dan Girardi. The Lightning signed the former Ranger to a two-year, $6 million contract on July 1, a few weeks after New York announced it had bought out the final three years of the six-year, $33 million deal he agreed to in February 2014. "You appreciate guys more when you have them with you," Cooper said. "You really appreciate him being in your locker room. When you have a guy like (rookie defenseman Mikhail) Sergachev ... he can go to guys like Girardi, but Girardi goes to him. The other thing is his willingness to sacrifice his body for the betterment of the team." Cooper later added Girardi was "everything our team needed." . During a stoppage in play in the second period, the 13,176 in attendance cheered and began a "Let's go Yankees!" chant after the final score from Game 4 of the AL Championship Series was posted on the video board. ... New Jersey scratched D Dalton Prout, D Ben Lovejoy and RW Stefan Noesen. ... RW J.T. Brown, D Slater Koekkoek and C Gabriel Dumont were scratched by the Lightning.